With a weak storm cruising across the northern half of the state, I headed south to the Southern Sierra with three days between my daughter's volleyball games. I had been wanting to visit Round Mtn south of Olancha Pass for some years now, and finally found a good opportunity. I additionally wanted to visit Peak 11,340ft immediately south of Olancha Peak, the two together making for a full day of some 20mi and more than 6,000ft of gain. I wasn't able to leave San Jose until nearly 9:30p on Saturday night, with something like six hours of driving to do. I was aided by a nap in the afternoon and the ending of daylight savings time which would give me an extra hour when clocks turn back. Late into the night, I pulled over at the Fossil Falls/Cinder Cone turnoff on US395 and slept quite comfortably without lights or road noise. I still had some driving to do in the morning north on the highway to Sage Flat Rd, eating breakfast on the way. I had no trouble negotiating the dirt section of the road which was in excellent shape, all the way to the corral and trailhead where I parked. Mine was the only vehicle when I pulled in and would remain so throughout the day. The cattle had long been brought down from the high meadows above and all was quiet, awaiting the first winter snows. Luckily there was very little of the white stuff to have fallen this far south in those first early season storms. Most of the snow had landed in the northern part of the range, extending the hiking season into November down this way. I was on the trail by 7:20a. Much of it was churned up by the cattle that had been brought down for the winter. The stock and hikers' trail shares the beginning and end with the Cow Driveway on its way to Olancha Pass. The latter goes almost directly up the drainage in a much shorter fashion, taking only three miles to reach the pass. The rains that had fallen since the cows were driven down had firmed up the churned dirt, solving the dust issue and providing decent footing. I had been up the trail only once before, back in 2001 during the last day of the first Sierra Challenge. I decided to take the Cow Driveway to see how the cattle manage it and was not disappointed. Make no mistake, the drainage is churned up by the hundreds of cattle that go up and down each season, the cattle often moving off the main trail and making all sorts of additional paths and generally making a mess of things. But I enjoyed the shorter route and got to Olancha Pass in only an hour and three quarters' time. Olancha Pass marks the start of the High Country pastures on which the cattlemen graze their stock in the summertime. There is a cowboy camp nearby, looking about the same as I remembered it 15yrs earlier. The Pacific Crest trail used to run up here past Olancha Pass, but it has been rerouted through Monache Meadows lower down and further west. From the pass, I followed the trail northwest over now gentle gradients for about a mile and half to a pair of trail junctions where the PCT is picked up. The trail then turns north and begins a climb of over 1,000ft to a highpoint at 10,300ft on the west side of Peak 11,306ft. I left the PCT before this, while still due south of the summit. Someone had left a rock-lined arrow pointing off the trail here. I think it is simply there to point out a flat bivy spot found under a tree just above the trail. I wouldn't expect the peak to have enough visitors to draw the sort of person who would feel it necessary to leave a rock arrow for future visitors. I climbed about 1,200ft up cross-country terrain over less than a mile to reach the peak just after noon. Gray skies made the views less dramatic, but they were nice, nonetheless. Olancha peak rises another 800ft higher about a mile to the north, the mostly dry Owens Lake can be seen down below to the northeast at the bottom of the Owens Valley. 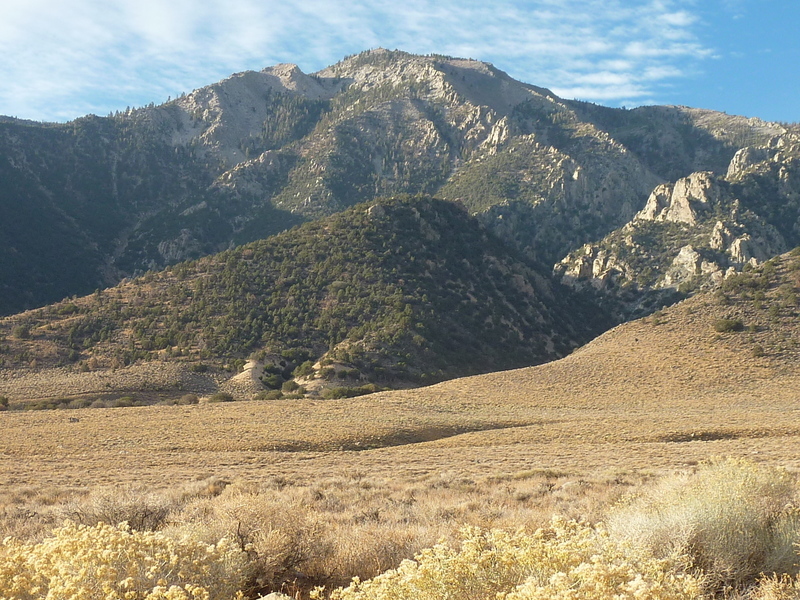 Monache Meadows lies about 4mi to the southwest, now brown in the fall season. I looked about several rocky outcrops vying for the highpoint, but found no register on this lonely summit. I returned to the PCT via a more direct descent down the SW side of the peak. A few deer that spotted me plying the trail did not seem overly concerned with my presence as I passed by. I briefly considered descending further down to Monache Meadows to tag Anderson Point and Deer Island, a few minor summits that have been on my radar. And though the distance to the nearest of these was less than 2mi from the PCT trail junction, the extra elevation gain was going to wear heavily on me and I'd likely be returning in the dark. Those two could be reached more easily from the Monache Meadows Jeep Trail, so I left them for a future date. Of more interest was Round Mtn, so after returning to Olancha Pass I turned south and followed the lesser used trail towards Haiwee Pass. Round Mtn is about 2.5mi southeast of the pass, but the first mile and half utilize the trail. I had no trouble following the trail, leaving it where it starts to drop down towards Honeybee Canyon. The cross-country to Round has mild brush, but with lots of weaving and not much trouble, there wasn't any real bushwhacking. It was after 2p when I reached the summit, views open in all directions. Of note was a nice view of the North and South Haiwee Reservoirs to the east at the southern end of the Owens Valley. I found no register here either. I returned back to the trail and then used a bypass trail to avoid returning all the way to Olancha Pass. There was a dead mouse on the bypass trail, looking rather forlorn, on its back with its little paws curled in front. On the descent I chose to take the Cow Driveway again, though I didn't enjoy it so much on the descent, the footing not feeling so great in the downward direction. There is much rock mixed in with the dirt making a fast descent difficult. I was imagining what it must be like to be one of the cattle herded down this route. Except for the front-runners, most must be half-blinded by the dust clouds that envelope the operation. You can see where a turn is missed and some of the cattle charged down a different slope, with all manner of terrain seeing hoof prints - some go through or under brush, some over small 4-6-foot drops in the creekbed. The cowboys on horseback must have some skill to keep them all heading in the correct general direction, picking up strays that get off-track in places. A few bones mixed in with the dirt and rock show that not all of the cattle make the descent, but the majority do, though probably not without a collection of scrapes and bruises. The sun was showing its last light on the Coso Range across the Owens Valley as I finished up the descent, returning to the trailhead at 4:30p. I would have enough light left to shower by and drive back down to the highway. I stopped at the rest stop near Coso junction to have dinner, drink a few beers and watch a movie, giving me a place to deposit my trash when I was done. Afterwards I drove south on US395 a few more miles to the Fossil Falls turnoff where I spent a second night. The end of the pavement is just far enough from the highway to get out of earshot and away from the headlights. I slept quite comfortably, undisturbed through the night.